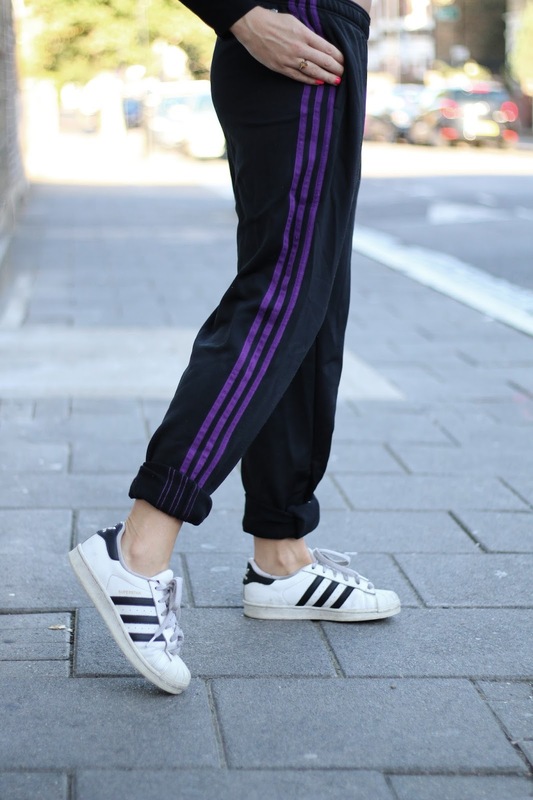 For as long as I can remember I have been a massive advocate of the tracksuit, ultimately putting my love of a three stripe down to those, dear-god-what-was-thinking, chav years and 'growing up' in the early 2000s. Kappa, head-to-toe velour, Adidas poppers: you name them, I had them. If I remember rightly I was the proud owner of about 8 velour tracksuits, and I kid you not, thought I was the bee's knees in them. I could not be happier that the tracksuit is back, in all it's bloody glory may I add. My old Adidas hoodies are now considered cool with the retro vibe totally working for this comeback trend. So, on my latest chazza shop haunt, I came across an old pair of Adidas bottoms and with the street style set donning theirs I was, of course, making the £2 purchase and joining them. No longer reserved for make-up, free days I recently wore these for more than 1 hour, albeit a slightly more casual day out but still, if I can get on board with a look that's on trend AND comfy then I'm basically winning at life. Looking back there are a few trends from that decade that I won't be welcoming wth open arms but this is certainly not one of them.